Followers of the Queens, New York outfit Black Sheep probably know that Andres "Dres" Titus, along with William "Mista Lawnge" McLean, helmed the Native Tongues affiliates during their early 1990s heyday. Back then, Wikipedia assures us, they were running with the Jungle Brothers, A Tribe Called Quest, and De La Soul, and their first album, A Wolf in Sheep's Clothing "gained them praise and recognition in the hip-hop community for unique rhythms and intelligent lyrics" on its way to RIAA Gold Certification. Those were the salad days. Once the dust settled, by the middle of the decade Dres, who is cousin to A Tribe Called Quest barker Q-Tip, was out on his own and in 1999 released the solo Sure Shot Redemption LP. That record was a critical success in the underground, but the wider world largely slept on it and by the early Aughts the Black Sheep were paired up again. Titus and McLean cut one more album, but that was 8WM/Novakane back in 2006 (you might remember the single "Whodat? "), which is like forever ago in hip-hop years. One would figure it was time for Dres to head out on his own again, and one would be right. He dropped an EP in December. That release was a precursor to his forthcoming full length LP, From The Black Pool Of Genius, out on April 6th. Though he still rides the Black Sheep name (Sure Shot Redemption was also released as by "Dres-The Black Sheep"), stepping out once more Dres is again without Mista Lawnge. The last time Dres was solo the reaction was crickets instead of cash registers, so he wants to go big this time and pull out all the stops. The first step was to get on the horn, and he's been Twittering. Which is how we know that he's been in the studio, "listening to my dude Psycho Les' mix of 'Important Fact' (Get Some Money) feat. him and Curious." Sensing some remaining character space, he blinked out "Black Pool Of Genius... brilliant" on the same post. That was a few hours ago, followed by the twit "RT @CHINOXL: In the studio pennen verse, about to drop for @rasskass @planetasia @krondon @phildaagony scenario2010 oweeeeeeeeee!" That's enthusiasm. Sure, he may get brownie points from Farhad Manjoo via Tweetdeck on an iPhone, but any fool from Queens knows that to get past the backpack Greenpeacers at Wired.com you've got to offer up a tasting platter for the masses, take it to the people and back up the e-blurbing with fresh sound. To wit, Dres sent out dispatches to his web soldiers and they released the MPEG-1 Audio Layer 3 hounds. There was the Dres Hot Track Of The Week mp3 for "I Wanna Rock" and the "Road Warrior" video, and the "Doin' It Wrong" mp3 and the "Forever Luvlee" video and mp3. On the album there is a Native Tongues reunion track of sorts, but Dres and Mike G talked about it already. The twittering is done, the free downloads are in the can. To bring some next-level madness, Dres has now gone all viral crowdsource style and announced "the official Prelude Remix Contest." Which, we might note, is not to be confused with any unofficial bootleg Prelude Remix Contests that may be circulating elsewhere. This official contest, which is open to "aspiring and established producers alike," is a remix battle with all five cuts of From The Black Pool Of Genius: The Prelude EP up for grabs. Five winners will be selected for yet another Dres release, always official, called the Prelude Remix EP, going out digitally as well. Farhad Manjoo is drooling. So, to recap, Dres has the album, out April 6th, but before that there was the Prelude to the album released this winter. And now there will be a digital Remix EP that remixes the Prelude issued before the album that is yet to be released. You've got to hand it to him, the guy gets some mileage out of his beats. 1) Download the acapellas and 2) send back a 320kbps MP3 [44.1kHz constant bit rate, normal stereo for you nerds] with a name and email address. Note that for simplicity of filing, Dres wants all remixes titled in the same format: "Name of Producer - Name of Track being remixed". Those glitching on remixes of all five tracks, send five emails. Entries will be judged and selected exclusively by Dres who, just to make it officially official, has issued a personal invitation to enter. He'll announce the winners on Thursday, April 15th, and along with their cut(s) on the EP, a free drum pack from Platinum Loops and a bunch of free records, "each winning producer will receive a free 16 bar verse from Dres on a beat of their choice." 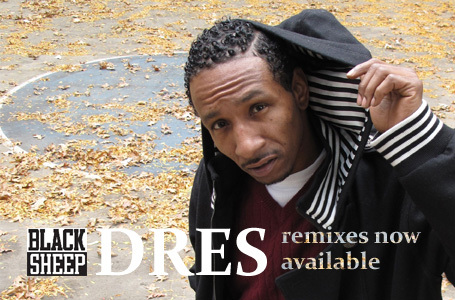 Just think, you're remixing for him now, but Dres could be spitting vocals for you this spring.